As most readers would be aware, I recently had the opportunity to replace the 130hp Yamaha Saltwater Series 2-stroke on my Cruise Craft 575 Outsider. The 2-stroke Yamaha was simply costing too much to run, and really restricted the range of the 160lt underfloor tank. At a fairly modest cruise speed of 25knots, the Yamaha was averaging about 1lt per km. That gave the tank a range of just 160km. Our closest reef is about 70km, meaning it would take a full tank of fuel to get out there and back. The 2-stroke motor was also noisy and smelly, not conducive of good family boating! In fact, we hated the motor right from the first time we turned the key. After spending over $60,000 on a brand new boat the last thing you want is disappointment. After putting up with poor fuel economy and a limited 19 foot glass boat, we actually decided to sell it! But again the 2-stroke came against us. Even though it was less than 2 years old and had minimal hours, nobody wanted to buy a large glass boat with a 2-stroke. Well, at least not for what we wanted. To get rid of the boat would have meant massive loss in money on a perfectly good boat it top condition. So after discussion with Emmanuel at Townsville Marine it was decided that re-powering my boat might be a better option than selling. I did, after all, love the hull and everything else about the boat. The Outsider was a boat Tania and I had been looking at for many years. The layout and design of the boat is ideal for a fishing family. All 4 of us can sleep in the cabin overnight and the deck space is plenty big enough for us all to fish. The two options we had were a DF140 and DF150 Suzuki 4-stroke. The DF140 is great option on a boat this size, and there are 575 Outsiders in town with that particular motor fitted. The weight to power ratio is very good in the 140, but we decided to go straight to the maximum rating for hull and bolt on the DF150. Being the maximum hp and transom weight for this boat, it was hoped that it would allow the boat to cruise effortlessly at low rpm and use minimal fuel while being able to push out some good speed at the top of the rev range. 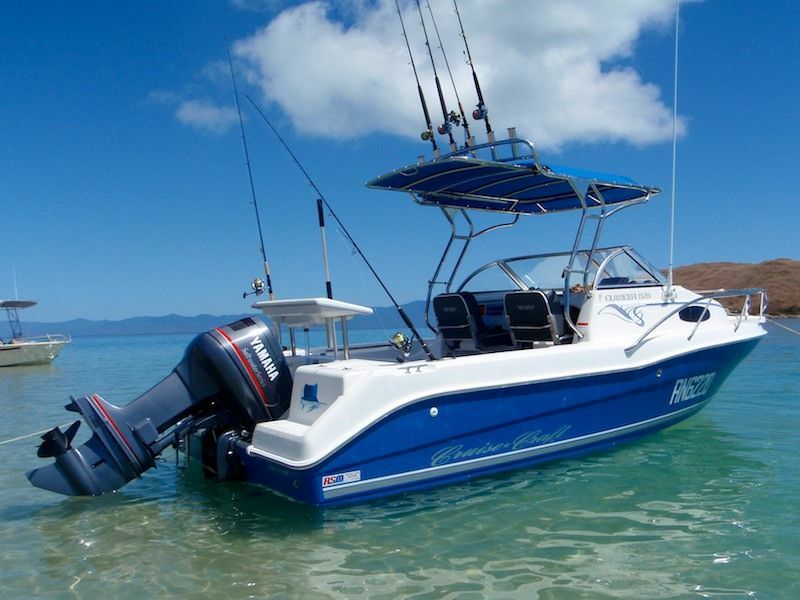 The motor was soon fitted, and the job Peter and boys at Townsville Marine did was second to none! The old oil tank for the 2-stroke was removed and the filler cap finished off beautifully. You can hardly tell there was ever a big hole through the fiberglass. The new gauges were fitted along with the control box. It looked just like the motor was an original fit-out. I think thats important when your talking about a boat that is almost new. At the same time I had Peter fit hydraulic steering and plumb in a the live bait tank and add a deck wash. Again the fit-out was outstanding. The first run with the new Suzuki was with Tania and the kids across to West Point. First turn of the key and I knew we had done the right thing. The motor ticked over immediately and you couldn't hear anything at idle. I had to look over the back to see the tell-tail running! Tania was on the ramp at the winch and didn't know the motor had even been started. I reversed off the trailer and drove over to the pontoon, the hydraulic steering was beautiful! When we got outside the harbor I pushed the throttle down and immediately the boat jumped up and out of the hole. The revs jumped and motor came to life. It really has a beautiful sound at high revs! AND NO SMOKE. Tania was suitably impressed. With the addition of a few little luxuries, this felt like we were in a whole different boat. The one we should have had from the beginning! The following pictures show the boat with the Yamaha 130 Saltwater series (left), and then with the Suzuki DF150 (right). The motor has now been on the boat for about a year, and I am as impressed today as the day it went on. The fuel economy in nothing short of outstanding. In good conditions we can easily manage 0.5lts per km at a smidgin under 25knots. This now gives the 160lt tank a range of over 300km. Basically I have halved our fuel consumption figures. At the same time we have gained 20 extra horses, bettered our top end speed and increased the handling of the boat. The tabe below shows actual fuel and performance figures from this motor fitted to my boat. The CC hull is a heavy fat beast of a boat for its size, and the motor still performs beautifully. Warranty Limited five (5) years for recreational use. My ONLY concern when having this motor fitted was its weight. It's not that its a particularly heavy motor for its size, but this is right on the maximum transom weight for the hull. And even the lighter 2-stroke Yamaha struggled at low revs to keep the nose down in choppy seas. I really thought this would make the boat back heavy and struggle at low speed. But the boat actually performs better. I can plane at lower speeds than with the Yamm, and the boat is faster out of the hole. Peter and Emmanuel both tried to convince me that the extra torque of the big block Suzuki would easily compensate for the added weight. But it wasn't until I experience the motor on the boat that I actually believed them! The extra 20 horses probably help too. When this particular motor was fitted, it came with the standard Suzuki analogue gauges. As impressed as I was with the motor, the gauges drove me bananas! I couldn't believe such a modern motor came with such obsolete gauges, even the Yamaha had a set of digital gauges fitted as standard. Luckily there is an alternative, and it wasn't long before I moved up and fitted a set of Garmin GMI-10's. 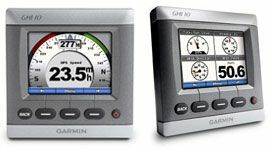 The GMI-10 is a Marine Instrument Display that plugs directly into an NMEA 2000 bus to display all manner of engine management information on a full colour customisable LCD display. Each GMI-10 features a bright 3.5" QVGA screen in a sleek 4"flush-mount bezel. I opted to install 2 units on my dash and each can be customised to display different sets of data at the same time. For me, the left hand unit is set up to display engine management information such as RPM, tilt/trim, and fuel remaining. The right hand unit is more for economy data. It displays speed, economy (lts per km), range remaining from fuel and fuel used. But the displays can be set up to show all sorts of data. The data can be displayed as graphics or figues with 1, 2, 3 or 4 sets of data on a single screen. Multiple screens can also be set up on a single display and then easily flipped between with a single button. The GMI-10 is capable of displaying a whole range of NMEA 2000 information including navigation, weather, fuel and engine management. The whole experience of re-powering my rig was, although daunting, a pain free experience. It was made very easy by the experience crew at Townsville Marine. I dropped the boat of one afternoon and picked it up in a few days with all the work completed. There are many arguments to be had about 2-stroke V's 4-stroke in outboard motors. The biggest argument is the extra cost of the motor compared to the fuel saved. Many argue that it takes years to save the difference in fuel. But for me, it was about the whole boating experience the 4-stroke offeres, not just raw fuel savings. I will probably never recover the cost of the changeover in fuel savings alone. But I now have a motor that is quiet, clean and powerful. I save not only on fuel, but 2-stoke oil that the Yamaha burnt at 1lt per 50lts of fuel. I have doubled the range out of my fuel tank and I will have good resale value later if I decide to sell that boat. Was it worth it? Hell Yes! If you are considering upgrading your old 2-banger and bolting on a fuel efficient 4-stroke then look no further than the Suzuki range of motors. Suzuki truly is the words best 4-stroke outboard. 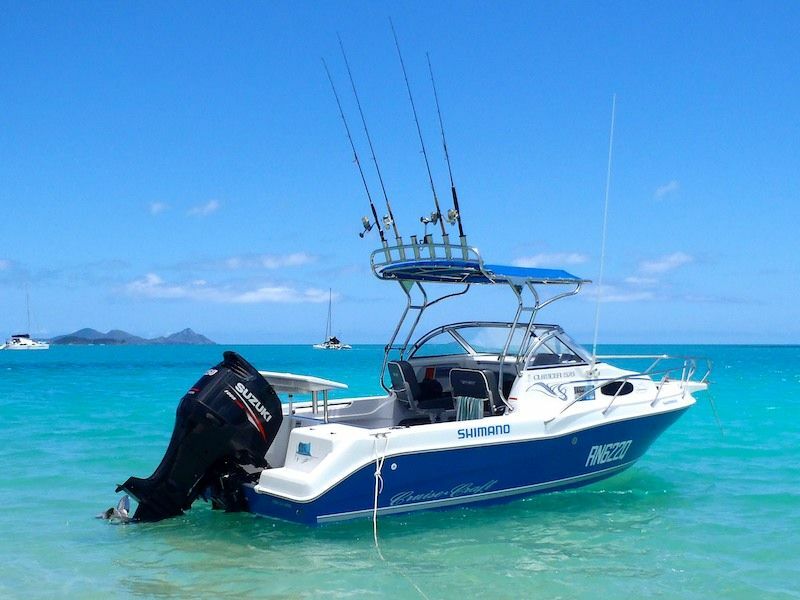 And Townsville Marine has the largest range of Suzuki 4-stokes in stock in Australia! Go see Emmanuel and team and ask for a quote. And do yourself a favor, get a GMI fitted at the same time. Well worth the investment.